The view Mr Pheng sees every day. We hungry students know that R5 noodles is the place to go for comforting bowls of warm porridge or sumptuous, springy noodles, but how many of us know about the history of the store and the background of the vendors? In conjunction with Appreciation Week, Raffles Press conducted a one-time interview with Mr David Pheng and Mrs Chan to find out about a perspective we rarely consider – the one behind the counter. A lot goes on behind the counter, earlier than we would expect. Every morning, the uncle reaches school at 5am – a time most of us students would consider an ungodly hour – to prepare food. As we wonder how he manages it, he replies with equanimity that “arriving later means there will not be enough time to prepare the food”. There are many preparations that need to be done, but the most important is the preparation of the broth for porridge, as a lot of time is needed to boil the water and cook the ingredients.The pair tend the stall for close to 12 hours daily, finishing a day’s work at 5pm. Even after that, there is still work to be done at home – did you know that most of the wontons you eat are homemade? Mr Pheng chooses to pre-wrap their own wontons for the most part, because “DIY-ing wontons saves money”. On Sundays, Mr Pheng returns to school for a few hours to get the ingredients and his stall ready for the week. Little wonder then, that he chooses to spend his hard-earned free time resting at home, and spending time with his family – his wife and two daughters, aged 11 and 16. With the long hours, we wonder why Mr Pheng chose to continue working with RJ, having worked here for an incredible 18 years. 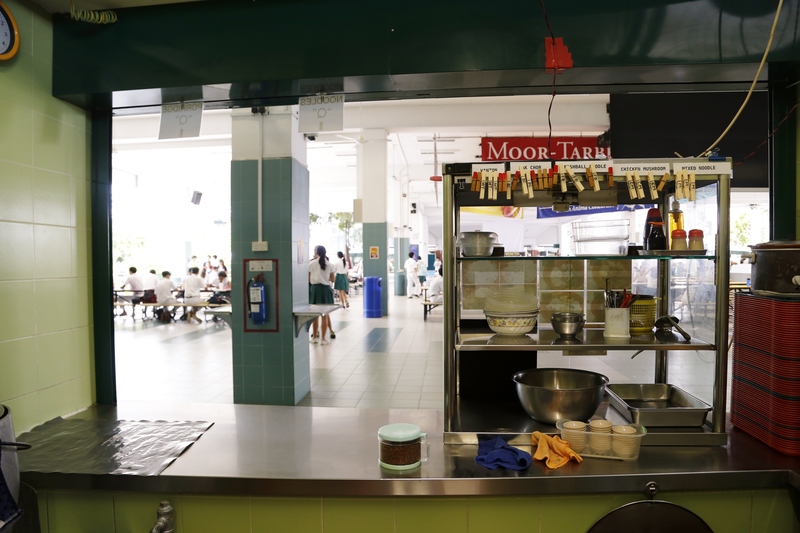 The stall was originally started by his mother-in-law at the old Mount Sinai campus, later shifting with the school to the current campus at Bishan. He responds with a simple “Can survive la”. He adds, “the students and teachers are nice as well, so that makes it easy”. In fact, “all of them are good students,” he says. His best memories are of old students paying a visit to his stall when they return to say hello, or to voice their appreciation. His advice for the students here? Mr Pheng says he has little to give, because he believes that the “the best experiences are those we work through on our own”. In this regard, he offers a short and sweet “all the best”. Mr Pheng and Mrs Chan. Here at Press we’d like to thank Mr Pheng and Mrs Chan for taking the time out of the schedule for this interview, as well as for working tirelessly behind the scenes to supply us students with hearty bowls of noodles and porridge. We rarely think about the lives of the people behind the counter who make our food and keep us fed, but perhaps giving a warm smile and saying ‘thank you’ the next time you stop by R5 Noodles would be a good way to let them know their efforts are appreciated!